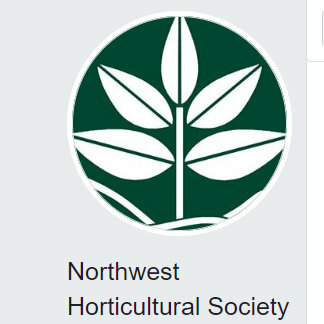 Why would a Portland, Oregon, gardener be interested in a book called Palm Springs-Style Gardening? 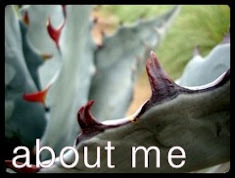 Two reasons…the plants and the extremes. 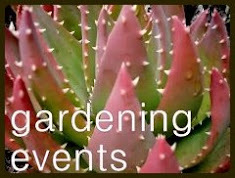 Many of the plants suited to desert gardening are my favorites, and I’m always interested to know more about them. Plus I find it very compelling to learn about gardening in a climate that is so different from mine, like a place where the dormant season is summer, not winter. After moving to Palm Springs the author, Maureen Gilmer, found there were few books available that addressed the specialized gardening needs of the Coachella Valley. Including unrelenting heat and sun (over 300 days a year), little water, strong wind, and soil that exhibits signs of its history as an inland sea. The extreme sun exposure and heat is startling to read about. I can’t imagine gardening in an environment where the temperatures are regularly so high that they stress a plant to a point where it ceases to photosynthesize. 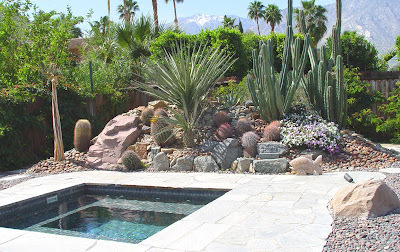 And while I plant in pots so I can move them to friendlier environments in the winter, when there is too much rain and cold, Palm Springs gardeners use such methods to protect their plants from too much sun and heat in the summer. 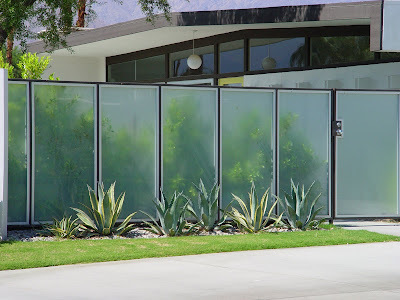 In Palm Springs the drying wind is also an issue, in this photo Maureen shows an example of how semi-transparent screens block the wind and yet still allow light into the garden. Isn’t it gorgeous? And it makes the area beyond private; for me the fact that it is a wind break is just a bonus. 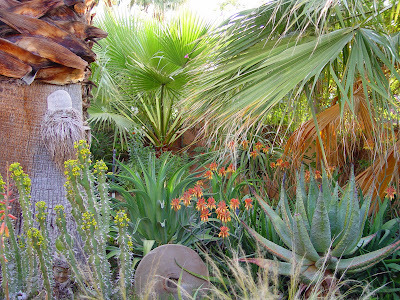 The chapters introduce readers to plants that will survive, and hopefully thrive in Palm Springs. 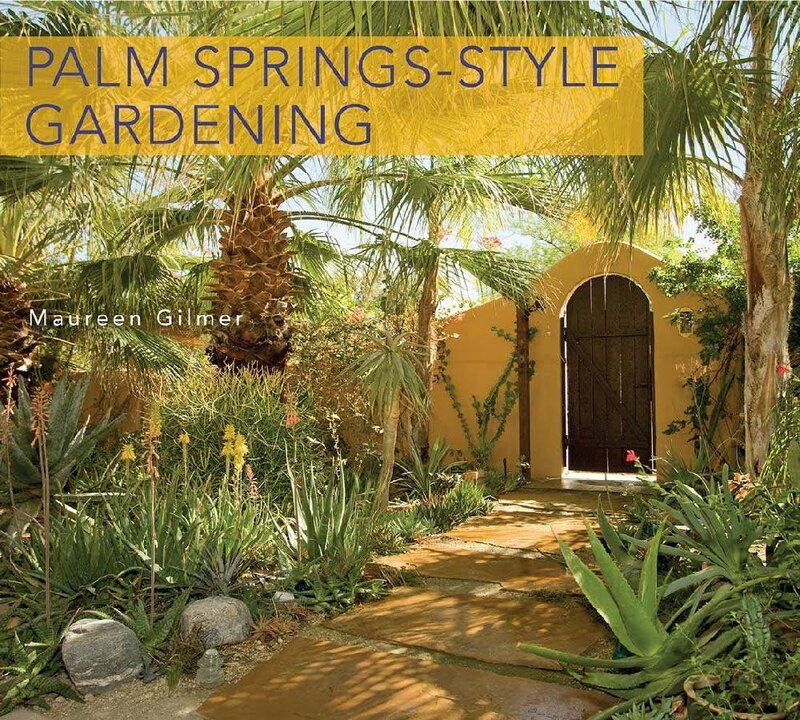 Since Palm Springs is, at least partially, still a winter respite for part-time residents there is a whole segment of the population that never sees the harsh circumstances that their garden is left behind to face. The selections in this book are aimed to help them make educated choices that will allow their garden to weather the cruel summer months. Another chapter called The Tropical’s includes this picture of a plant I know (and love) as an indoor grower, the Sansevieria. Isn’t this a great entry way? I want to live in this house! Perhaps a future vacation to Palm Springs is in order. There is also a section on the evil Agave Snout Weevil which unfortunately has wiped out most of the “old growth” agaves throughout Palm Springs. I pray I never see this pest in my garden. Hopefully it’s terrified of our cold temperatures here in the Pacific Northwest. And just when I was feeling serious climate envy the author notes that New Zealand Flax is a “no-go” In the desert. Finally! Something I can grow that they can’t! Seriously though this was a great read for Fall in Portland when we’re facing the coldest wettest months of the year ahead. I enjoyed being transplanted to a place where the sun is too bright, and Summer too warm! 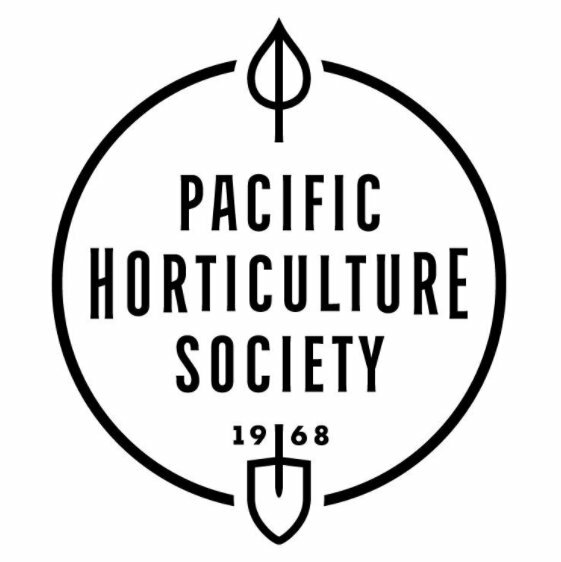 And in case you are wondering here is my disclaimer…I purchased the book Palm Springs-Style Gardening and really enjoyed it, so I wanted to do a blog post about it. I contacted the publisher to make sure they were ok with my scanning and including a few pictures. Not only were they ok with it but they sent me these jpegs of the pictures I wanted to include in my post. Everything in life should be this easy! Hi DG~~ Welcome to the world of book reviewing! Timber Press is equally generous. Word of mouth advertising is a win-win-win, for sure. 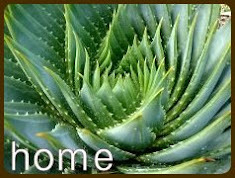 The last photo is gorgeous with the various shapes and textures. The weevil can definitely retire in Palm Springs. We certainly don't want him migrating up here. 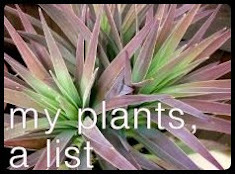 Not being able to grow phormium in Palm Springs is more evidence that we live in the gardening capitol of the world! We can grow almost anything here. Don't you just love it! I never really thought about the problem of too much summer in these desert gardens. I always assumed they had it easy there, but I guess they have more challenges than we do, we're pretty lucky with our mild conditions. 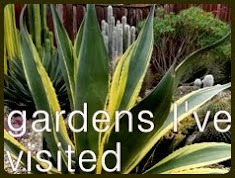 I can't imagine a garden you only visit once a year, but my dad seems destined for a Palm Springs retirement home, so maybe I'll get to see one up close one of these days. I can't believe that tiny snout weevil can do so much damage! If it weren't so destructive, it would be kind of adorable. Nice review, Loree, and it's always great to see photos from the book too. Austinites have more in common with Palm Springs gardeners than with Portland gardeners, I bet, but I'm sure their summers are still worse than ours. Unfortunately, the snout-nosed agave weevil is entrenched here. I lost a 'Macho Mocha' mangave to it in my old garden. The pictures are pretty, and I like the semi-transparent screen as well. When hubby and I were deciding where to settle, I decided to come to Spokane and put up with cold winters instead of moving to a place where you can fry eggs on the top of your car for much of the year. 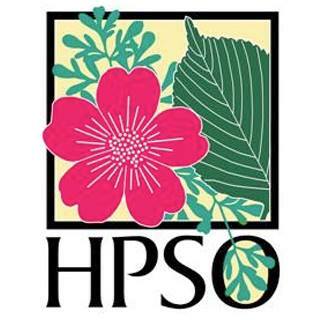 It's nice to know that gardeners find something that will grow in such a challenging climate. Grace, hopefully winter will prove us right and our Phormiums will still be looking fabulous come spring. Not like last year. Pam, I wondered about you and you fellow Austinites (?) as I was reading this book, wondering if the issues I was reading about were the similar to what you face. Death to the weevil! Megan, and maybe you'll even be designing your dad's garden?! 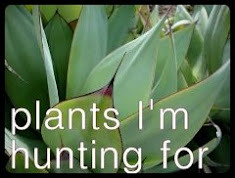 I volunteer to be your agave buying assistant! VW, yikes! You actually chose Spokane winters? You are a brave gardener! I think I'd prefer the fried-egg route...as long as there was sure to be a/c everywhere I went.